Many of our business customers use custom 4x9 doorhangers for local marketing campaigns when targeting certain regions or neighborhoods in a city. 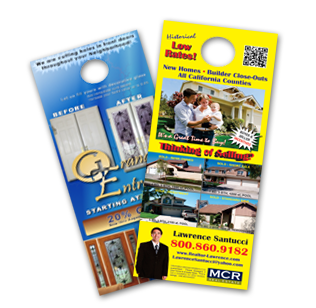 We print doorhangers on our 10pt cardstock or 16pt premium cardstock. America's Printer offers full-color custom diecut printing for 4" x 9" doorhangers or for any custom shaped piece you are looking to print. Ask your APC Sales Rep about our custom diecut printed business cards and flyers too. Here are the results for the options you've chosen. Use the drop-downs below to view other options available for this product. Can’t find the quantity or options you're looking for? We can still help you, just contact us. The time requirement for print orders & graphic files is 12:00 PST (Pacific Standard Time), monday thru friday. Print orders placed before this time can be processed for production that same day. If you request a digital softproof before printing, we must have your approval within 2 hours of your graphic files being emailed to you. This will keep your print order on track for NEXT DAY and other print timelines we offer. Since we print 24 hours a day, we have in many occasions accelerated your print job through our system with the assistance of your APC Rep. Please contact your APC Rep for these special requests. AmericasPrinter will not be liable for timelines not being met. All posted turnaround times are approximate based on the success of our printing process and we will make every effort to meet these timelines.